Moulin Rouge was received with mixed reactions from audiences when it came out. Some felt it was to flamboyant to be taken seriously, while others said it was a "Romeo & Juliet for the twenty first century." The movie was directed by Baz Luhrman who also directed Romeo & Juliet back in the 1990's and it bears his signature style. The film is about a young writer by the name of Christian (Ewan McGregor) who falls for a beautiful courtesan named Satine, played by Nicole Kidman. When they first he, like all other men who see her, is hopelessly in love with her; she, on the other hand, only sees him as just another suitor whom she can play with. Along comes a Duke, played by Richard Roxburgh, who, once he sees Satine, decides he must have her no matter the cost. From there we have a nasty love triangle that develops into something more. Christian begins working closely with Satine and as time passes she begins to feel for him as deeply as he does for her. This movie is based off the musical of the same name, but unlike in the original, the movie relies on contemporary music to relate the character's thoughts and feelings. This works quite well as it helps connect a new audience that may have shied away from it. Now that it has been released on Blu-ray we can relive the special moments in the film whenever we wish. As always with this format that picture and sound quality are top notch, but we are also granted a plethora of bonus features. To start off we have a picture in picture documentary with director Baz Luhrman as well as the Director of Photography, Production Designer and Screenplay writer. There is some uncut footage and an outtake of Nicole Kidman's first vocal test. We get an in depth look at the music for the film as well as interviews with the cast, crew, writers, and designers. Finally there is the BD Live function, which allows those of you who have an Internet connection with your Blu-ray player to access IMDB.com for more movie information. Obviously there is a lot of work that went into the production of this DVD, which is always nice to see. For fans of this movie or even new comers, this is a DVD worth adding to your collection. 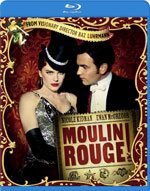 Download Moulin Rouge from the iTunes Store in Digial HD. For more information about Moulin Rouge visit the FlickDirect Movie Database.